A state-of-the-art Regional Eye Clinic will open its doors in the second-largest city in Armenia this fall. With an extraordinarily generous donation from Luther J. Khachigian, the Armenian EyeCare Project is developing our fourth Regional Eye Clinic in Armenia and will celebrate the Grand Opening of the Gyumri Clinic this September during our 2018 Medical Mission and Armenia Trip. EyeCare Project physicians, staff, donors and friends, along with local dignitaries and representatives of Armenia’s Ministry of Health, will gather in Gyumri for a reception and ribbon cutting ceremony to mark the clinic the John Ohannes Khachigian AECP Regional Eye Clinic, named after Khachigian’s late father. The Gyumri Clinic is being funded by the Project’s largest campaign to date — Five-for-Five — developing five Regional Eye Clinics in Armenia for $5 million in five years. Since the campaign was launched in 2015, the Project has developed four Regional Eye Clinics throughout Armenia in regions selected by the Ministry of Health (MOH) where they are needed most. The MOH considered a number of factors when deciding upon the five locations, including the number of people who will be served in the geographic area; the absence of an eye clinic and too few ophthalmologists and eye care personnel. 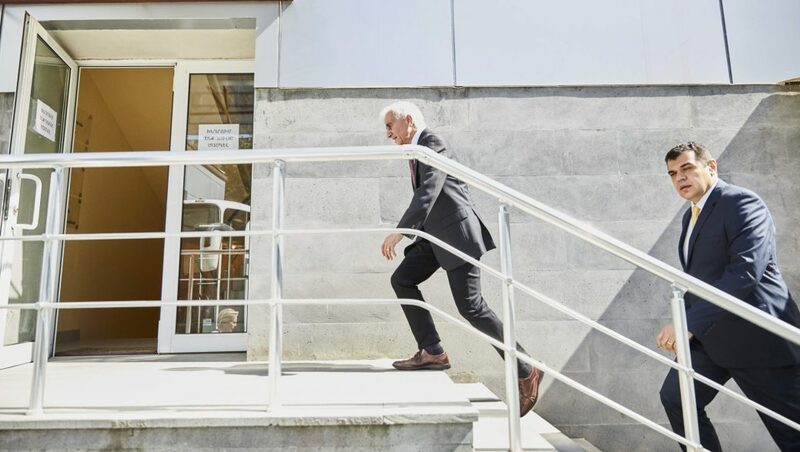 The Haig Boyadjian AECP Regional Eye Clinic opened in Ijevan, Tavush in 2015; the John and Hasmik Mgrdichian AECP Regional Eye Clinic opened in Spitak, Lori in 2016; the AECP Kapan Regional Eye Clinic opened in Kapan, Syunik in 2017; and the John Ohannes Khachigian AECP Regional Eye Clinic will open in Gyumri, Shirak in 2018. The EyeCare Project will reach its goal of developing five Regional Eye Clinics once it completes the Yeghagnadzor Regional Eye Clinic in Vayots Dzor, planned for opening in 2020. These Regional Eye Clinics will enable the EyeCare Project to accomplish our mission — that all citizens of Armenia, no matter their geographic location or financial status, will have access to quality eye care. 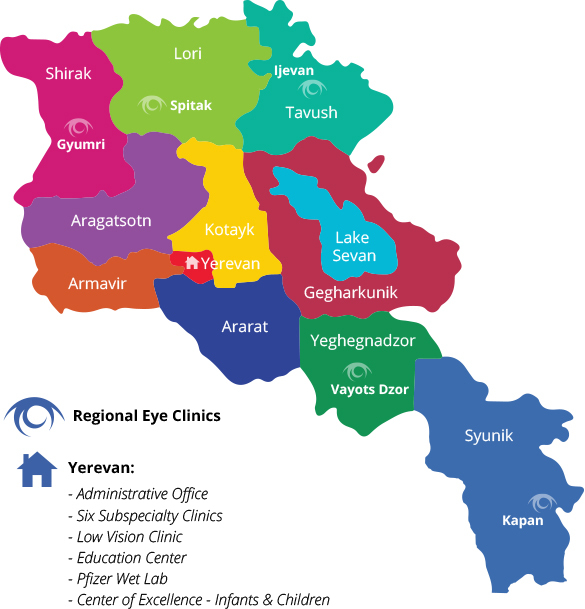 Access to eye care in Armenia is extremely limited today especially for the poor and those living outside of Yerevan where two million people live. Just 35 of 48 regional cities have ophthalmology services and only five offer basic surgery. Advanced care is available only in the capital city of Yerevan. Access to eye care is further restricted by a lack of ophthalmologists and equipment. Today, because of limited access to eye care in the regions just 24 percent or one out of four Armenians with cataracts receive surgical treatment. With the Regional Eye Clinics providing access to cataract and other surgeries throughout the regions, thousands of Armenians will be able to have their vision restored.